1.7 - 1.9 °L - Xtra Pale is a modern 2-row base malt designed for very light-colored ales. While it works great as the base malt for any beer style, it is particularly perfect for today’s extra light colored pale ales and IPAs. Xtra pale is germinated like a pale malt to have a high degree of modification for easy brew house conversion. However, it is then uniquely kilned like a pilsner malt for a very light color. The result is a malt that easily and quickly converts like a true pale ale malt, but is as light or lighter than most pilsner malts. We at MoreBeer! wanted an ale malt that was specifically designed for blondes, light pale ales, and light IPA's. 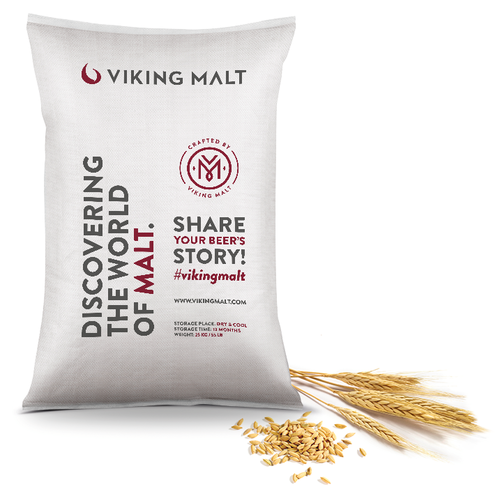 We approached Viking and worked to together to design the specifications for this malt. Unique light-colored barley varietals were chosen and the germination and kilning processes were selected while we were onsite at their Strezgom malt house in 2018. Compared to other 2-row base malts on the market that were originally designed for big breweries, and are neither true Pilsner or true Pale Malts, Xtra Pale was specifically designed for light, craft-brewed ales. Viking Malt is one of the largest malting companies in the world and the largest roaster of specialty malts. They are the main malt supplier to the famous Carlsberg brewery. Viking is not well known in the USA because they haven't had good US distribution. Because MoreBeer! and MoreBeer! Pro is directly importing thousands of tons of malt we are stoked to offer you Northern European malt quality from one of the best malting companies in the world at lower than domestic malt pricing. Viking Malt has 6 malthouses in areas where distinctive Nordic barley are sourced: in Halmstad, Sweden; Vordingborg, Denmark; Lahti, Finland; Panevezys, Lithuania and in Sierpc and Strzegom, Poland. The advantage of northern European malt is lower protein levels, good kernel size, and less amount of pesticides used due to the cold winters.